Black girl's dress with pearls AW17 PETITE LOOK 19 Poca & Poca is a perfect proposition for an elegant party. Classic, flared knee-length dress creates a modest background for refined add-ons. 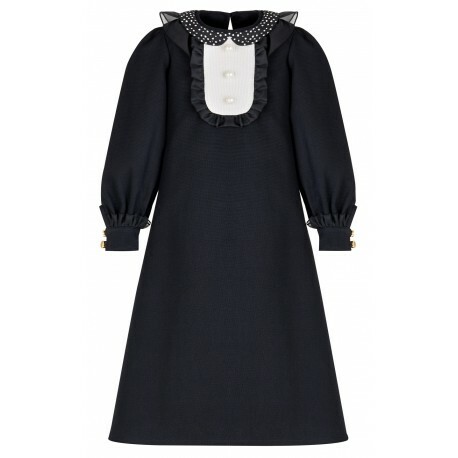 Long, wide sleeves are crowned by gold buttons and flounces. A round polka dot collar, wrapped with a mist of ethereal, mesh flounce, corresponds with the sleeves. The dignified blackness is highlighted by white pearl bubbles on the neckline.